Cryptocat, Tor Messenger, and BitTorrent Bleep let you chat with your friends in privacy and security. Many people like the idea of increasing their privacy with encryption and anonymity tools for sharing files, web browsing and messaging. The trouble is finding tools for the job that aren’t overly complex. 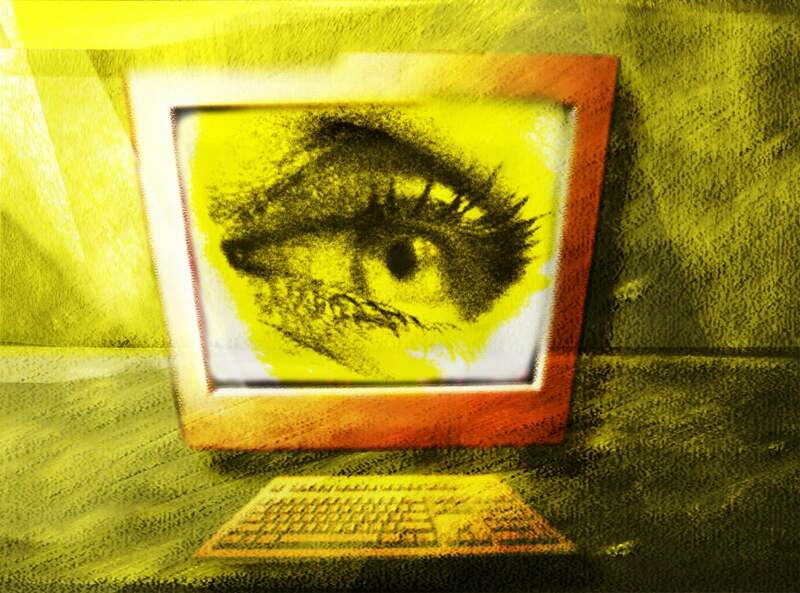 Today’s tip will take a look at how easily you can use current privacy tools to chat with your friends in privacy and security. 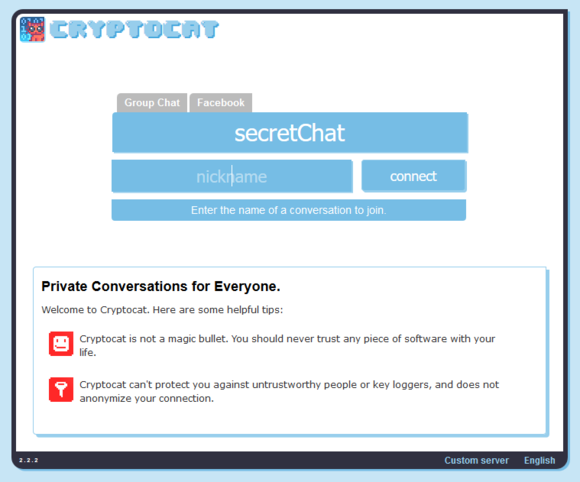 The easiest tool to use for encrypted online chat is Cryptocat by developer Nadim Kobeissi. First you have to install the add-on for Chrome, Firefox, Safari, Opera—there are also apps for OS X and iPhone. 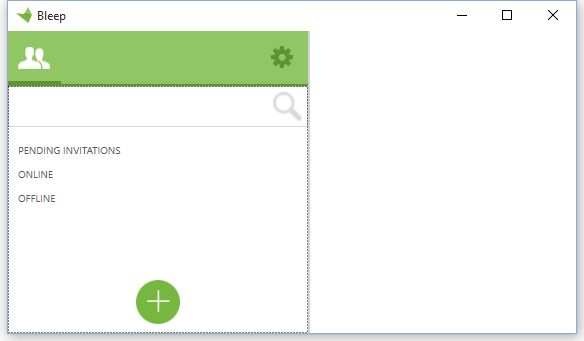 Next, just click on the add-on icon in your browser, which will open a new tab with an interface similar to the one you see here. Fill out that form with the conversation name, the nickname you want, and hit connect. Next, your encrypted chat tab will appear. Now you can just share the name of your conversation with others, and they can use that information to join your covert online meeting. The Tor project recently released a beta version of a traditional desktop instant messenger called Tor Messenger based on the Instantbird project. Tor’s version features Off-the-Record (OTR) encrypted messaging and, because it uses the Tor network, provides a reasonable amount of anonymity as well. To take advantage of OTR, the person you’re chatting also needs an OTR-enabled chat client. 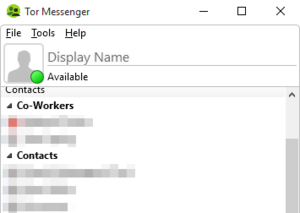 Tor Messenger integrates with a number of existing chat services including Google Talk, Facebook Chat (not working at this writing), and Yahoo. The program also works with Twitter, IRC, and generic XMPP. Note: At this writing, the beta had a minor bug in it that caused the program to crash in Windows 10. Advanced users can fix the bug on their own with the workaround on this thread. Otherwise we expect a fix to be made public soon. 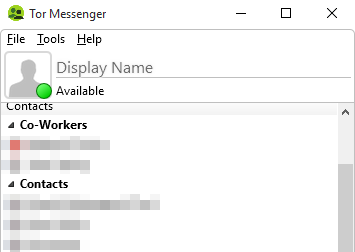 Like Tor Messenger, Bleep is also a desktop, client but it doesn’t work with existing chat clients. Bleep depends on the BitTorrent protocol to share messages, and it functions as its own chat service. To connect with friends on Bleep, click Settings > Be Added by Friends and share your public key with them. To add a friend using their public key click the “+” icon at the bottom of the screen, paste their public key on the next screen, and then click Add Contact. Bleep is probably the most complex of the three programs, but once you get the hang of it it’s really not that hard. Whether you prefer to chat using the browser, a desktop app, or absolutely must use Google Talk, one of these programs should suit your needs to keep your conversations private.